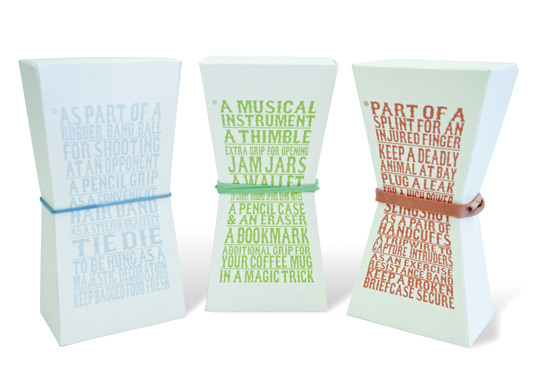 What a brilliant way to communicate the product – something that is rather dull – in an exciting and instinctive way. Love this. Really simple, really clever, and best of all you get to touch/test the product without having to open the box. This is great work – combining packaging form with product attributes and finding a way to bring the product out of the pack is really inspired. I can imagine brand managers of diet packet soups, lite-bite chocolates and other slimmers products taking note. The concept is a little like the special k innovation with the scalloped side, but it takes things several notches further. One to watch if Ric seeks further packaging projects. brilliant Ric. You have worked so hard on it all this time in the studio we used to be there and you would be working on that idea. It has paid off. Your famous. Terrible font choice for the strength of bands. 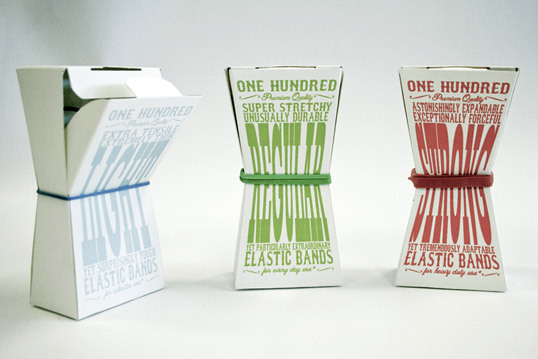 Three box shapes and band application to out side of box is impractical from a commercial production perspective. Very creative! I would buy these. Very nice and clever work! Love the cleverness of this! This has the simple brilliance that the work of Tibor Kalman had! love it `cause there`s concept behind! Congrats! Now this is just fantastic. 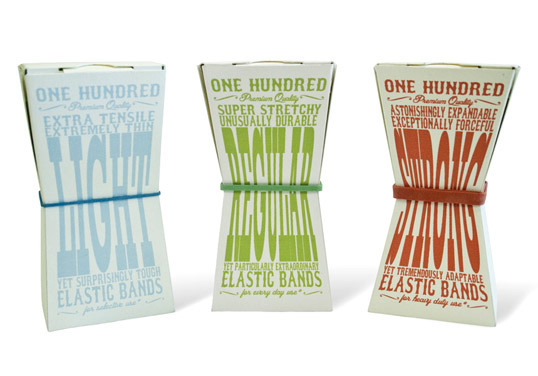 Have no idea who would buy that many bands, but is a very clever concept. Awesome! so clean and neat, wonderful idea! 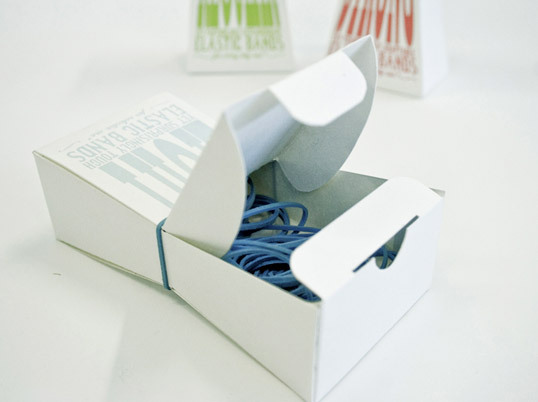 If anyone ever just needed one rubber band, they could just nick the one off the box. Brilliant design that conveys the product so well.